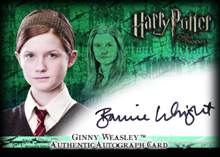 Ginny Weasley™ Authentic Autograph Card [Harry Potter and the Order of the Phoenix]. . Wallpaper and background images in the Bonnie Wright club tagged: bonnie wright bonnie wright ginny weasley harry potter autograph warner bros..
Keyword: bonnie wright, bonnie, wright, ginny weasley, harry potter, autograph, warner bros. This Bonnie Wright photo might contain portrait, headshot, and closeup.